June was a difficult month for gold investors and enthusiasts as the metal had its first decline in three months. 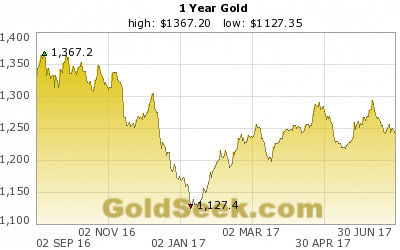 However as an overall investment for 2017, gold is still up over 8% from where it started on January 1. Gold prices settled lower Friday, suffering from their first monthly decline since March, with a fourth straight weekly fall driven by a rise in global bond yields, which diminished appetite for precious metals. The outlook for gold going forward in the second half of 2016 appears to be ripe for much higher prices since the Fed appears to be focused on raising rates no matter what other economic indicators reveal, and confidence in the dollar is waning as the global reserve currency has lost around 9% of its value on the dollar index in the same time that gold has gained 8% in price.